It’s a legend in the magazine industry. In fact, it may be the most legendary magazine cover of all time. It was 2008, and Esquire magazine had wanted a special way to celebrate their 75th anniversary. So they commissioned a special “collector’s edition” which included a small e-ink screen that was embedded right in the magazine’s cover! This was just 11 months after Amazon had released their very first Kindle, so there was something magical about seeing the same technology used for the cover of a magazine. Esquire touted it as an symbol of the future, demonstrating “a revolutionary technology that will change the way we all read paper magazines in the years ahead.” If you look today, you can still find videos of it on YouTube. It flashed the words “The 21st century begins now,” in bold, black letters, and it also included five color, thumbnail-sized photos. It’s four years later, and I can still see those five photos on my copy today. (I have a theory that Esquire painted them onto the displays, and just used the battery-powered e-ink to display the words and to darken or brighten the pictures.) Tonight I found the old issue in a box of old papers, the same copy I’d bought at my local bookstore back in 2008. A lot’s changed since then — but it’s still pretty impressive! They’d spent more than a year planning that special cover. In fact, it was actually a full eleven years ago that the magazine first started thinking about e-ink. Two of their editors had visited the start-up company that created the technology, in Cambridge, Massachusetts, back in 2001. But at the time “the circuit boards, the power requirements — and the cost — just couldn’t be made small enough to use in a magazine,” Esquire‘s editors explained. Even then, the logistics were incredible. 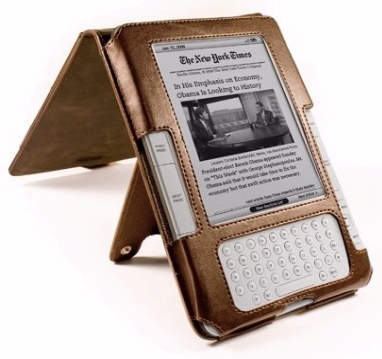 The creators of e-ink had to create all the custom circuitry for the displays, designing something that was not only thin enough, but also flexible enough to bend like the rest of the magazine’s cover. And when the big day finally, came, the magazine was actually shipped in refrigerated trucks — from China to America — because the power supply wouldn’t drain as quickly if the magazine was stored at a cooler temperature! Even the magazine’s printing presses had to be carefully modified so the shocks from their binding machines wouldn’t damage the covers. In the end, each issue of the magazine travelled more than 7,000 miles. After the displays were assembled in China, they were flown across the Pacific ocean, where each one was then individually attached by hand, by a team of workers in Mexico. 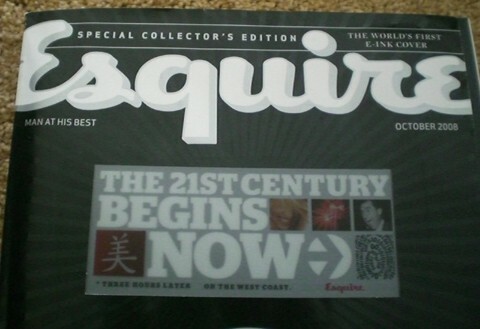 “We think we’ve taken an important step into the future of magazine publishing,” Esquire concluded in the introduction at the front of their special edition.